Beauty Costs > How Much Does Hemming Cost? How Much Does Hemming Cost? Hemming is a sewing procedure where the edge of a piece of cloth is sewn to prevent the fabric from unraveling and is done in order to make that article of clothing fit better. The price for hemming is different depending on the type of clothing that needs to be serviced, the amount of clothing, the complexity of the job and the professional performing the job. On average, the typical hemming job is going to cost anywhere from $5 to as much as $100. The geographical location, the fabric and article of clothing can play a rather big role in the overall price. Refer to our table below to see what most hemming jobs will cost on average. Generally, a smaller job such as hemming a dress or a pair of jeans can cost $5 to $20, while a wedding dress or suit can cost as much as $100. PromDressShop.com, for example, showcases their prices and mentions their hemming ranges from $10 to $15 depending on the size. According to a forum post over on TheNest.com, forum members on this particular thread stated that hemming cost them anywhere from $56 for three pairs of jeans to as much as $10 to $22 for one pair of jeans. 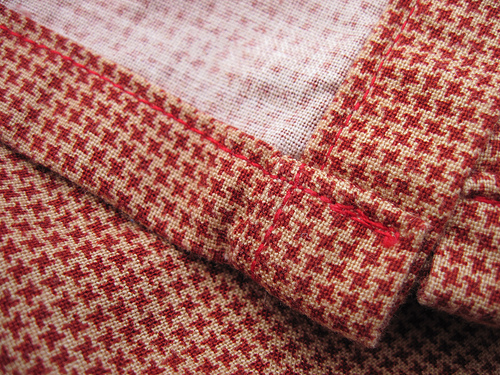 If the original hem is not available, this can result in an additional cost for the fabric. On occasions, a professional measurement may cost extra depending on the tailor performing the job. Each type of clothing can affect the overall cost. If the pants have to be lined as well, the cost can vary as well. Rush orders can cost more. Hemming is already a way to save money. By hemming a piece of clothing, this reduces the chance of your clothing being ruined. However, make sure to ask the person that will be performing the procedure what is the best way to fix the dress and ask for special deals when obtaining their services. Repeat customers are often given discounts for their continued services. Bulk drop offs can result in cheaper prices as well. Generally, the more you drop off, the more of a discount that can apply. Check with the professional ahead of time to see if they have any discounts available. Consider doing it on your own. It is not the hardest process if you already know how to sew. DaciaRay.com has a guide on how to sew your own jeans. If you don’t feel like attempting to do it, consider talking with some family members to see if they can help with something such as this. If they can, leave them a small tip for doing the work.